Meat lovers rejoice! 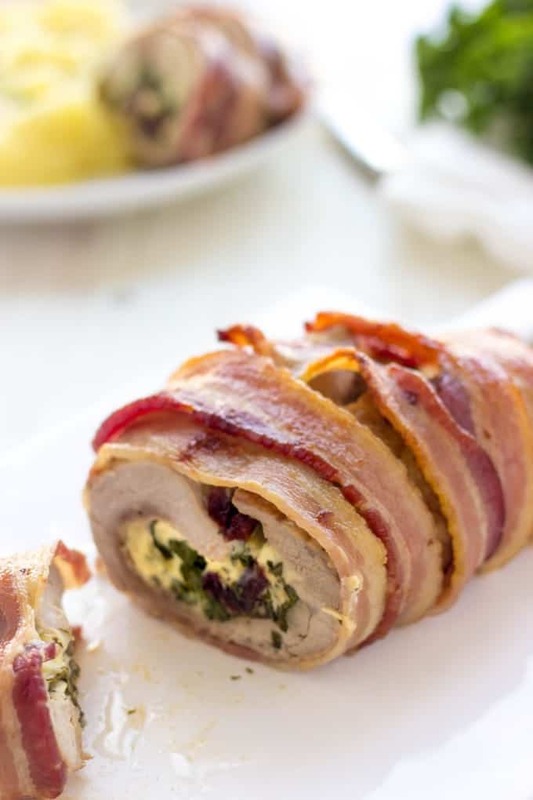 This Cream Cheese And Kale Stuffed Bake Pork Tenderloin in a Crispy Wrapped Bacon is a pleasure to your tastebuds. If you make it just once, I promise, you’ll be making it again. I haven’t cooked anything with pork in ages. Not that I don’t like pork, but for some reason chicken and turkey became our most purchased kinds of meats. Despite that I cook pork quite rarely, I have a couple of mind-blowing recipes that I haven’t shared on the blog yet. And I figured, the timing couldn’t be better to share one of these recipes with you today. So, what do we have today? Wait, are you holding on to your seat? Read slowly. 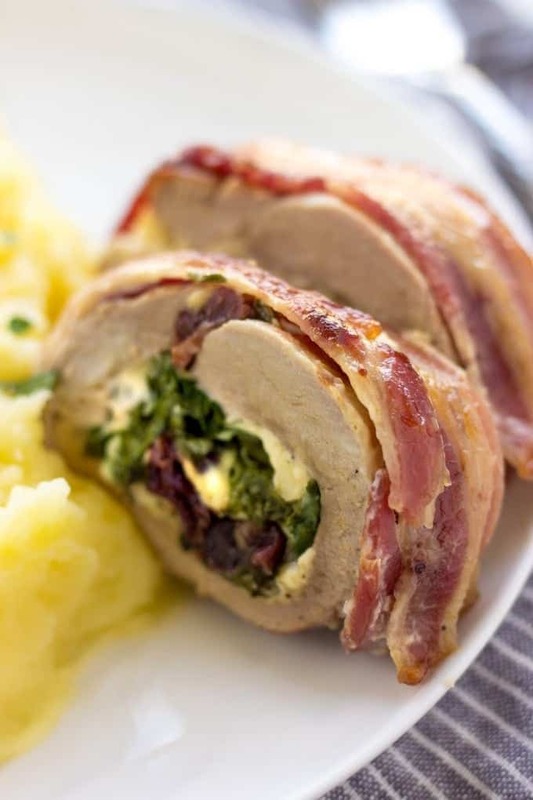 It’s CREAM CHEESE AND KALE STUFFED PORK TENDERLOIN WRAPPED IN BACON. I hope you’re already hungry. You just can’t go wrong with such ingredients, can you? And you know what, this pork tastes just as awesome as it sounds. And I’m not exaggerating. It is super tender, aromatic, with creamy inside and crunchy maple bacon outside. Let me reassure you, if you make this recipe once, you’ll be making it again, it is that good. I’ve used to make this recipe with pork loin which is a thicker cut and is more suitable if you’re planning to feed many hungry mouthes. This time, however, I’ve made the recipe with a pork tenderloin. Despite, that the cut is thin, it’s enough to feed 4 people. In order to stuff pork tenderloin, you need to butterfly it first. If you’ve never done this before, here’s a good tutorial. Make sure to pound the meat nice and flat. It should be approximately 1/4 inch thick. In a small bowl mix together cream cheese, kale, garlic, dry cherries, pine nuts and ¼ teaspoon of salt. Place pork tenderloin on a flat surface, sprinkle both sides with the remaining ½ teaspoon of salt and pepper. Spread cream cheese mixture evenly over a tenderloin leaving ½-inch border on all sides. Tightly roll tenderloin into a log tucking in ends so that it was the same thickness. Heat oil in a large non-stick skillet over medium heat. Sear tenderloin from all sides until nice and brown, about 5-7 minutes. Lay the bacon next to each other on a flat working surface. It can slightly overlap. Place stuffed tenderloin on a bacon and roll a pork up. The seam should be facing down. Transfer tenderloin on a baking dish. Brush the log with maple syrup and bake for 50 minutes, busting every 20 minutes with the pan juices. Let it cool slightly and then cut into thick pieces. Serve with mashed potato, pasta or rice!